Wagamon Ranch is a secluded, quiet, scenic community in Northern Blaine. Set up against woodlands on 3 sides, Wagamon has tree lined boulevards, substantial monument, and a private community pool and clubhouse campus. Large pond in the community is forty five (45!) feet deep. Wetland areas have been engineered with the watershed district and are being established and maintained during build out. 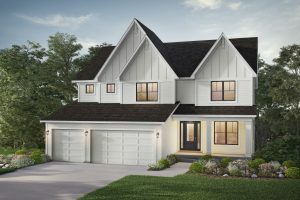 This is the legacy neighborhood in Blaine – all homes will be built using James Hardie cement siding. Model open each weekend. Phase II lots are completed and open – these are some of the most spectacular lots in the northern suburbs – views, privacy, setting. Model and spec homes for sale all the time.